I got the unexpected and very sad news last week that Jackie Seaton, whom I had the great pleasure of working for many years ago, had died. I new he had been battling multiple myeloma for the past few years, but last I heard, he was in remission, so the news came as quite a shock. Jackie was a salt potter who worked and lived with his wife Joni, just outside of Perth Ontario. I lived with them for two months in 2003 while I worked as Jackie’s apprentice—throwing, trimming, mixing glazes, loading kilns—to help him get ready for the Perth Autumn Studio Tour. I was fresh out of art school when I worked for Jackie—more ideas than skills in my toolbox. 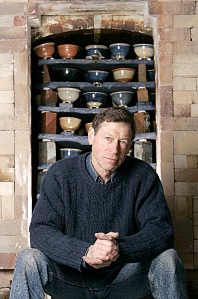 Jackie taught me so many little details about how to be a good potter… too many for me to list here. But it is no stretch to say that I use the skills he taught me in my own practice daily, and would not be the craftsperson I am today without having met him. Jackie was also a committed activist and fundraiser, and was instrumental in starting up an Empty Bowls fundraiser in Perth. This now annual event has raised over $15,000 already in 2013 for local food programs; for this event area potters make and donate hundreds of bowls, and local restaurants donate soup, and for a mere $20 you get a bowl (which is yours to keep) filled with delicious soup. Aside from teaching me some of the physical skills of being a good potter, Jackie taught through example what it meant to be a great Craftsperson (yes I intended to capitalize that!). He showed me the value of creating and fostering a community and the importance of getting involved. And, while it may be a cliché, he really does live on through all the people whose lives he’s touched through his pots… I’ve recently started teaching myself, and just last Thursday (the day he died in fact), I was passing on to my students a few of the invaluable tips he’d taught me. Life really does come full circle. This entry was posted in Community, News and tagged functional ceramics, inspiration, Jackie Seaton by naomiclementpotter. Bookmark the permalink.